On Mai 1, 1998 founded the registered society "Kaiserschützenregiment Nr. I", translated into English this would be "Imperial Fusiliers regiment number I". People interested in tradition and history have been gathering and are still coming together under this flag. Collectors as well as historians have also found a place of mutual interest there. We have worked out and documented the history of the regiment, fostering its tradition. Our aim is to give the general public a better understanding of the life of an ordinary Imperial Fusilier and to illustrate his life as authentically as possible. We have our own meeting place, an extensive library and many video cassettes illustrating "the Austrian southern front" and we provide a collection of very interesting original documents from the First World War. festivities of our province, and so on. Moreover, we would be happy to welcome you in our society. 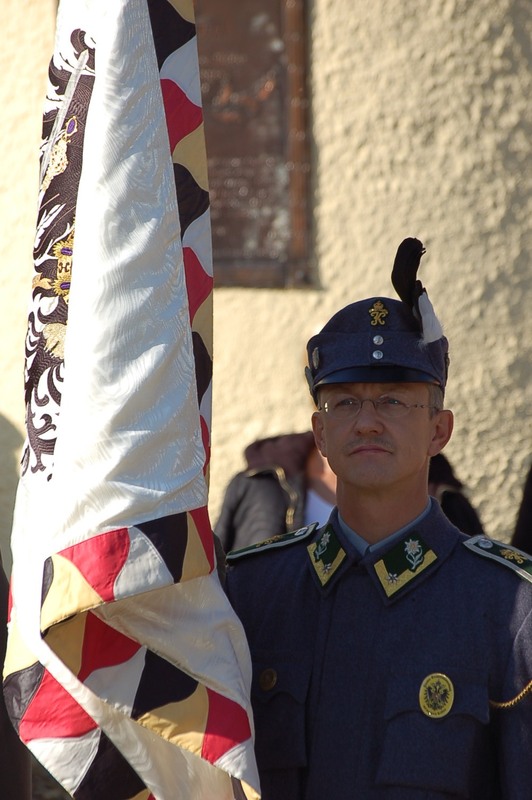 The history of the Tyrolean Fusiliers starts in 1323, when the national defence of Tyrol is set up. In 1917, the history of the Imperial Fusiliers begins and consequently also the history of the regiment of the Imperial Fusiliers number I. In 1813, the fusiliers of the Tyrolean province are mentioned by name for the first time. On September 19, 1870, sanctioned by the Emperor, the Tyrolean Fusiliers become part of the national defence force and are divided into ten battalions. On Mai 1, 1893, these battalions are reconstructed and divided into three provincial fusiliers regiments. This date marks the beginning of the first regiment's history. The provincial fusiliers regiment number I is being formed of several provincial fusiliers battalions: the number I "Unterland", the number II "Innsbruck/Wipptal", the number III "Oberinntal and the number X "Vorarlberg". Its regimental headquarters are in Innsbruck. With the military reform of 1901, the Innsbruck-based imperial and royal 88th provincial fusiliers brigade is set up, consisting of the provincial fusiliers regiments number I and number II. The first regiment is renamed imperial and royal provincial fusiliers regiment number I. On January 16, 1917, by order of His Majesty Charles 1st, the three provincial fusiliers regiments are renamed into Imperial Fusiliers regiments. With the fall of the Austro-Hungarian Empire in November 1918, involving the disbanding of the Imperial Fusiliers regiments, the military history of the regiment number I ends too.